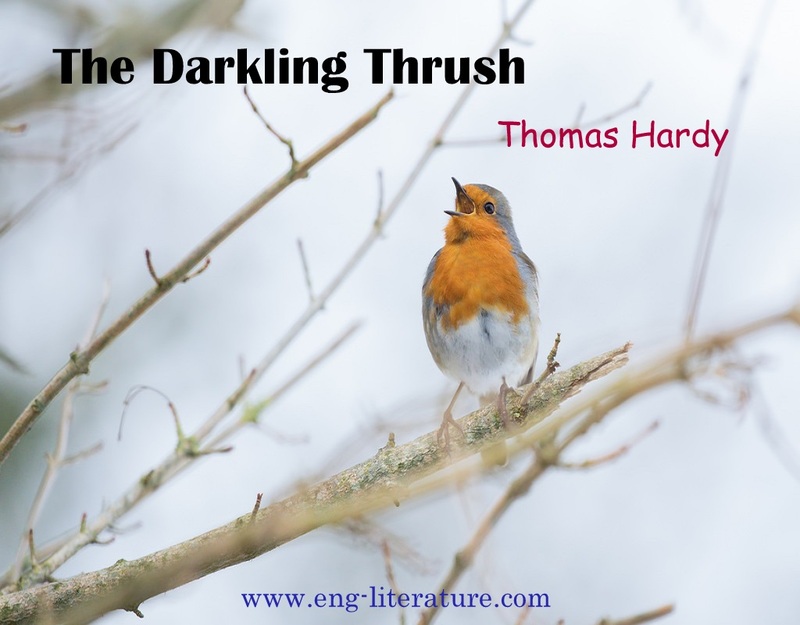 British Literature Broad Notes Poetry Bring out the contrast between Hardy’s Pessimism and the Thrush’s Optimism in the poem “The Darkling Thrush”. Bring out the contrast between Hardy’s Pessimism and the Thrush’s Optimism in the poem “The Darkling Thrush”. Thomas Hardy is a detached observer of life and a typical product of the Victorian spirit – ‘Fin-de-siècle’. As a poet Hardy’s vision of life is that of a pessimist. Unlike Robert Browning, he finds no hope, no consolation in the life-long tunnel of darkness. His none-too-happy views of life are actually ‘exploration of reality’, for he always strove to grapple with problems of human character and conduct. His “Darkling Thrush” shows the contrast between the desolation of the wintry scene and the joyous song of the aged thrush, between affirmation in the world of Nature and the negation in the poet’s heart. According to A. E. Housman, there is always a “satisfying flatness” in Thomas Hardy’s poem. Darkling Thrush begins with a typical Hardyan narrative opening. Winter is drawing to its close and the scene around him is cheerless. People living nearby had retired indoors. There was frost which was pale as ghost. The inclement weather of the winter still prevailed and the sun has already set on the western horizon. The stems of the bine trees have already reached the sky. Each and every member of the society was in earnest quest of their domestic entertainments. The poet is leant upon the gate. The sharp features of the landscape appeared to be the corpse or dead body of the nineteenth century. The century was almost dying. The process of birth and growth seemed to have stopped in the rigorous winter. The sky was cloudy, a storm was blowing. Every living being felt gloom and depression. But suddenly a song issued from the dark and decayed branches of the tree. It was spontaneous and it comes from the inner most core of the heart. It was excessively joyous and delightful. An old thrush that was lean, frail and weak was singing to his heart’s content in the midst of enveloping darkness. His plume was perturbed by the gust of wind. The poet finds the ray of hope in the bird’s song. He hopes for the coming golden future. Hardy’s thrush represents his pessimism in the midst of optimism or reversal. It seems that Hardy is stranded between optimism and pessimism, between hope and despair. The evening symbolizes left helpless, despair, frustration, metal darkness and disillusionment. But the song of the thrush symbolizes the spirit of hope, a hope for a world of beauty, a world which is devoid of ugliness, the hope of the beginning of a new era or century or Millennium. It represents the passing away of an old century and heralding of a bright and hopeful new century. In The Darkling Thrush, Hardy the pessimist sings the glory of Hardy, the optimist. Although all was not right with his world, yet all was not wrong, all was not dead. Only for a moment, the pulse of the life seemed to stop but in the very next moment with all spontaneity life spring up with all its “joy illimited”. Beneath the wintry desolation there lies the eternal pulse of germ and birth. Behind the death of the old century there is the birth of new century, behind death and despair there is hope and life. From the very title of the poem it is clear that the thrush is sitting in the dark in the encircling gloom just like Hardy himself in “the long drip of human tears”. Yet out of this gloom bursts a song of hope, out of the goodnight air trembles forth an air of good morning – “if winter comes can spring be far behind”.